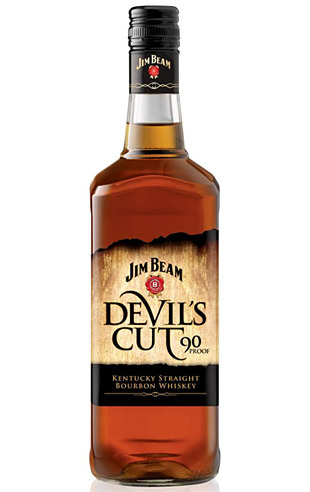 Jim Beam Devils Cut launched recently to the sound of deafening silence, in fact the first I heard or saw of this product was when I discovered it on the shelves of my local liquor store. I have to confess, the packaging didn’t immediately inspire me with confidence – looking very much like it was designed to attract the Mountain Dew and Whiskey cocktail drinking crowd rather than any sort of whisky aficionado. Thankfully curiosity got the better of me and, bottle in hand, I read the accompanying marketing bumf. It seems that “Devil’s Cut” refers to the residue of whisky left in emptied casks (and hence the opposite of the Angel’s share) that has never before been extracted for consumption. The boffins at Jim Beam have developed a technique for getting at this hitherto wasted whisky and for that alone, we should all raise a large glass to them – cheers to them! How they do it isn’t explained but I have visions of casks spinning like centrifuges with whisky flying outward in showers of spirity wonder! So what about the whiskey itself? Well unlike many of the other reviewers out there (whom I suspect may have been swayed somewhat by the cheapo label design) I actually really liked Devil’s Cut. The extra wood notes and in-your-face style seems to have awoken the sleeping slightly stagnant giant “run of the mill” Jim. This entry was posted in Whisky Reviews. Bookmark the permalink.